The delirious seven piece group from Cardiff, Wales has finally released their debut last 25th of February named, Hold On Now, Youngster. I’m really eager to know how the whole album sounds, with such a ridiculously extensive titled track listing, complete with unnecessary punctuations. In the end, I found that it was hard to sit through the whole album, proving that the songs were just as ridiculous as the titles. I know that sounds a bit harsh and it’s still too soon to say, but purely on first impressions, the album, despite the fact that it sounds amusing and they seem like they’re having a lot of fun, translates to me as reckless and inharmonious. But hey, maybe it’s just me. But among the bedlam, one track stood out than the rest, and it’s the same song that I’ve posted up before here, but this one being the 2008, LP version. I can’t just diss the music made by the Los Campesinos!, because they’ve produced one of the undeniably best songs I’ve ever heard last year. ‘You! Me! Dancing!’ is that exuberant, energetic number complete with anthemic riffs that’ll leave you dancing on your feet. The LP version contains an intro that’s prolonged and clocks in merely at 1:30. This time the instruments build up at a higher rate; beginning with soothing guitar parts that’s meant to lure you in as it progressively builds up into a cacophony of instruments. Which then it starts to drown and choke you up, as you gasp for air, till the familiar, relieving riffs starts resonating and you finally feel like you’ve been pulled out and restored to safety. I guess what I’m trying to say, is that the intro creates a nice effect for the listeners, and of course the chorus is sparkling and is sure to get you singing along (how can you not? ): It’s You! / It’s Me! / And it’s dancing!. Maybe you’ll love them, maybe you won’t. Maybe you’ll love the new album, maybe you won’t. But here are two songs from the album, anyway. 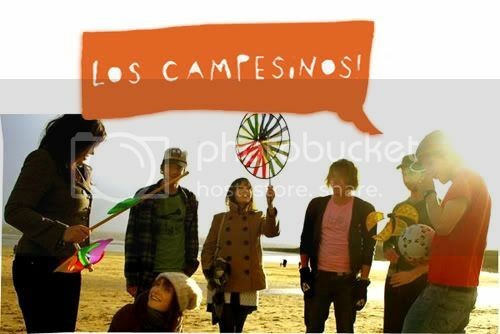 |mp3| Los Campesinos! - Death to Los Campesinos!